Keeping a record of your ideal glucose levels is an essential part of managing diabetes. Having a blood glucose meter will allow you to do this easily and efficiently. However urine tests are still an important part of keeping on top of your glucose levels, checking for ketones, but the sugar meter makes keeping an accurate reading more simple. 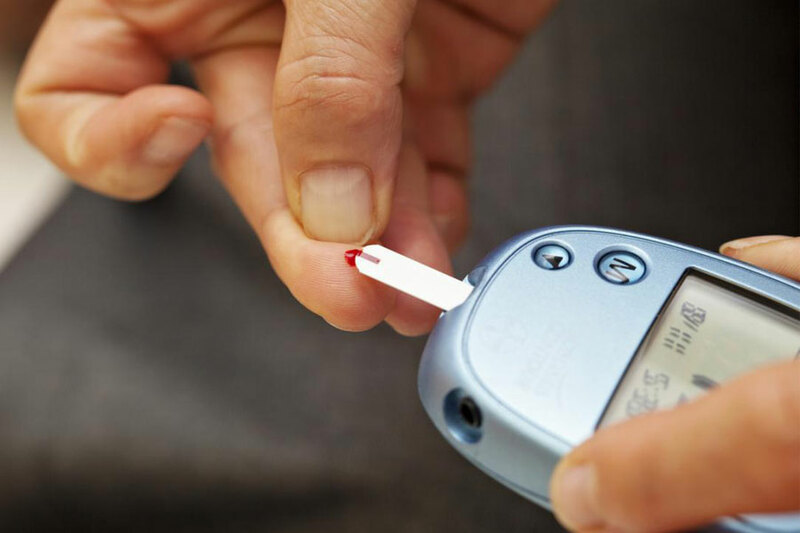 Picking a blood glucose meter that is right for you depends on a few factors; the products that are available to you, including the costs of the testing strips used and what device your doctor recommends best for your own individual requirements. There are a number of different glucose meters to choose from which will benefit diabetic patients, whatever their circumstances may be, enabling them to regularly carry out self-testing using the machine and to receive confident and accurate results every time. Having a blood glucose meter therefore means that the patient can use these products while on the go or travelling and always have peace of mind that they can check and record their glucose levels. The TRUEbalance test strips are glucose meter testing strips that feature the TRUEfill technology. These strips only require a small sample of blood, only .5 microliters per sample is needed to still gain fast results. 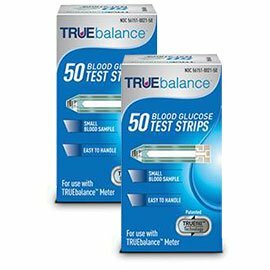 The TRUEbalance test strips are extremely easy and straight forward to use, however they must be used with the TRUEresult or the TRUEgo blood glucose monitors, as these are the only compatible machines that take the TRUEbalance testing strips. The strips cost up to 30% less than other leading testing strips making them a good purchase both financially and medically. It is reassuring to know that the TRUEbalance brand of testing strips are covered by most private insurance plans as well as by Medicare, making them a good choice for the user. Diabetic patients need to feel safe and secure in knowing that the products they are using to maintain the correct glucose levels will be correct, it is an important part of looking after their condition. 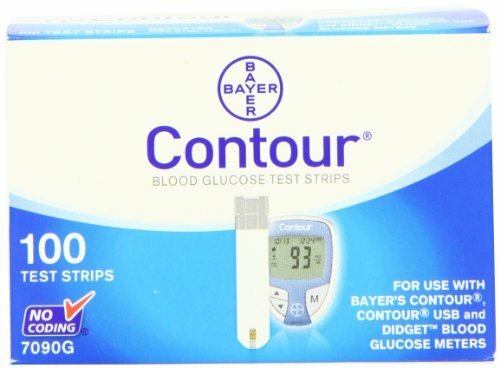 The Bayer Contour blood glucose testing strips come in handy packs of 100 strips. The strips come in two vials of 50 strips in each. Each strip only requires 0.6 millilitres of blood for each sample so minimal blood is needed yet maximum results are achieved. The Bayer contour blood glucose meter itself is easy to use and delivers accuracy in results and helps you to manage your diabetes type 1. These strips provide good value and confident readings for diabetic patients to feel self-assured in knowing that their blood glucose levels are without any fuss, which is handy when the levels are needed to be checked quickly, without causing any problems. The strips are simple to use and function at their best with the Bayer Contour Blood Glucose monitor, but they can be used in conjunction with other blood glucose monitors too. The strips are coloured white making the results easy to see visually, giving verification that the test has been carried out correctly. 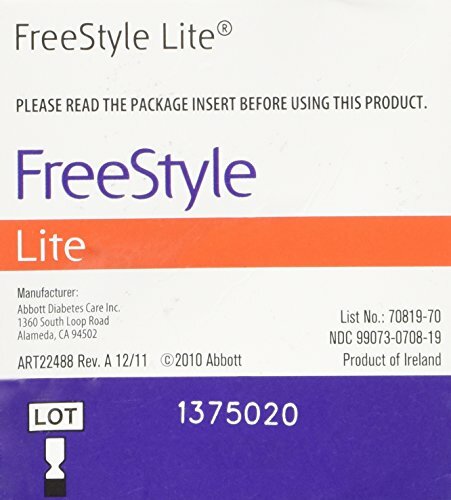 These Freestyle LITE Glucose testing strips made by Abbott have been manufactured especially for the Freestyle LITE Glucose blood monitoring system; however, these strips can also be used with the Freestyle freedom LITE glucose meter. The strips themselves are slim line feature the iconic butterfly, with no coding required to use them. The sample of blood only needs to be a very small amount yet can still allow for an accurate and instant result for the user. The site testing can be alternated for quick and easy use without the need for any form of coding. Each box contains 50 of the Freestyle LITE glucose testing strips. These testing strips should give diabetic users confidence and reliability backed by the company Abbott producing them. Using the butterfly symbol lets them stand out from the crowd and differentiate between other brands. The Freestyle LITE blood glucose meter will use these strips to deliver speedy results with minimal effort.